Crabby like eat when watching TV! OK, you get the picture. There are a few times of year when I turn into a slack jawed, knuckles-scraping-the-sidewalk-when-I-walk, mouth breather. It happens whenever I watch the NFL playoffs or the NCAA basketball playoffs, (OK, OK, it happens when I watch Giada too). For March Madness, CrabCake 2 and I set up our own pool. We parts of as many games as possible. We talk trash at each other based on who's leading in the brackets. But come finals weekend, I also like to throw in some good old fashioned, clog up those arteries, man food. This year it's going to be "barbecued" beef brisket and brownies (not just any brownies, but you're going to have to wait for part 2 to get that recipe). True barbecue is art. It takes days of preparing rubs, fussing over coals, adjusting smoke levels and arguing about wet vs dry. Well I'm not doing any of that. I'm not going to spends days and days worrying about something that's as likely to end up on my shirt as is likely to end up in my stomach, (I only do that for Thanksgiving). So today we're going to cheat. We're going to take a few big shortcuts that, when combined with a few beers, will go unnoticed. This recipe is based on 2 lbs. 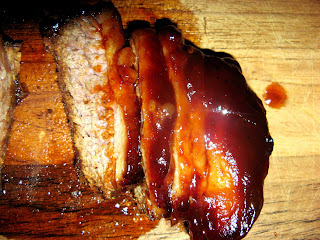 of beef brisket, though it can be made with a 2 lb. boneless pork loin roast (and turned into shredded pork). It can probably be doubled or tripled if you have a big enough cooking vessel. A Crockpot, Le Creuset or oven safe pot. If using an oven instead of a Crockpot, pre-heat to 200 degrees. 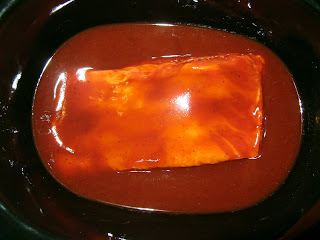 Mix the bottle of BBQ Sauce, beef stock and honey in the insert (or cooking pot). Place the beef (fattiest side up) inside the pot, liquid should nearly cover the meat, if it doesn't, add water. Cover. 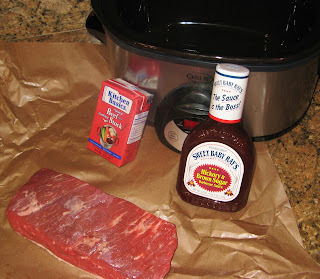 Turn on crockpot to low (or place covered pot in oven). and cook, undisturbed for 6-8 hours. No peeking. After the cooking time, slice beef or shred pork roast. Serve on soft white hamburger buns. Add some more BBQ sauce to the sandwich. Watch the game. Slobber all over yourself. Tip 1: Instead of honey add 1/4 cup of diced, canned pineapple (this is especially good with the pork). Tip 2: Thinly slice some jicama (often called a Mexican potato, though it seems more like a radish) and garnish each sandwich with a slice. For those of you living in remote areas, try using regular radishes (though they have a pepperier flavor than jicama). Tip 3: For those that like it really spicy dice up some jalapeno for a garnish. Tip 4: Some shredded Monterey Jack cheese also makes a good garnish. Tip 6: Have lots of napkins handy. Clean-Up: Well that depends if your a slob using real plates instead of paper, but lets call it 15 minutes. Crablings, this is as easy as it gets and the result is pretty darn good. Give it a shot. Next time SS Sal will take you through a brownie recipe. Until then, just remember, you can do it, you can cook.